In the future, the cyborg will be at the center of the design. What tasks and potentials arise for future-oriented designers? Which design principles can be based on cyborg-centered design? Nanomaterials are produced chemically or by mechanical methods. The exponential minimization of technologies facilitates their integration into the body. The initially invisible technique inside the body becomes part of his identity, which is made perceptible and tangible by the Body User Interface (BUI). Technology enables the networking of the cyborg with his environment: Human becomes the transmitter. 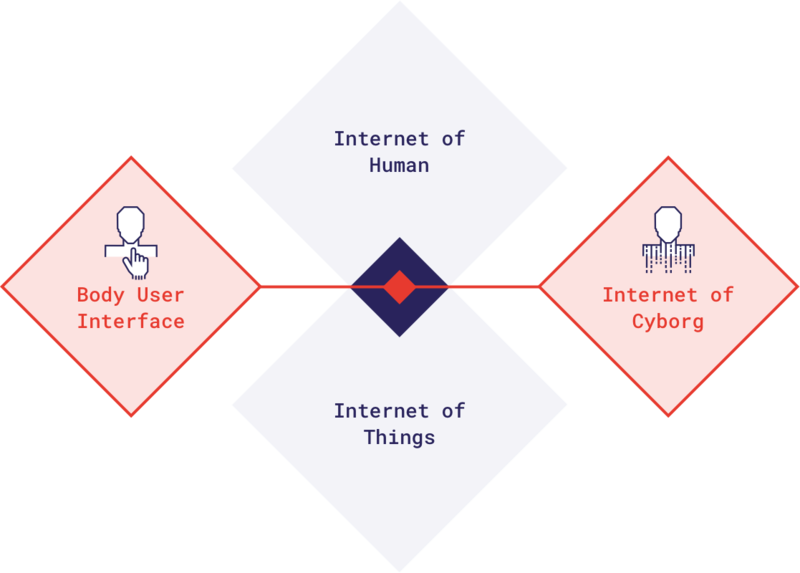 The term Internet of Cyborg describes the linking of cyborgs with physical and virtual objects in a structure – similar to the Internet. With the integration of intelligent and communicating technologies into the human body, the cyborg becomes part of a networked system in constant communications with his environment or ambient intelligence. Inspiring others to design our future! We prepared some themes to explore, what you can design! Get inspired! Implanted technology gives the designer the possibility to use the body as an interface. It will be his job to define how informationflows into everyday life of te user. How might natural stimuli function as information carriers? Natural Stimuli can be boosted or expanded. How do Cyborgs communicate to each other? Sharing data can strengthen personal connection. How might we use parts of th body to trigger information? Specific parts of the body can function as a reference. How might information be entered and demanded? Common gestures can be used to transport data inside the body. How might we combine physical and virtual world? In an emergency, intelligent products can intervene automatically. How might a Cyborg communicate with his surrounding? Objects in its environment can allow access. How might we give the user the opportunity to intervene? How might we use parts of the body to trigger information? Technology can display information directly on the body.